Now that your home is looking rejuvenated why let an unsightly driveway spoil the pictures and view. 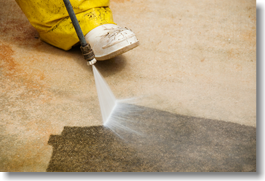 If your driveway has seen better days and deserves a spruce up you can choose to have it pressure washed to get it back to its former glory. Painting the inside of your home rejuvenates and breathes new life into your home and creates the perfect mood. To complete the transformation, this month Bloomin’Good Painting will have the rest of your house sparkling too with a professional cleaner who will come in after all the paint work is finished and give your home the once over, on us!